Bhagwantgad stands by the Kalaval creek in Malwan Taluka of Sindhudurg district. Spread across 1.5 acres of land, Bhagwantgad is bestowed with pristine dense forests. On the other side of creek one can see Bharatgad fort. Picturesque beauty of Konkan and along with these two forts is a must see. The Sawants from Sawantwadi and Chatraprati from Kolhapur had frequent battles between them. 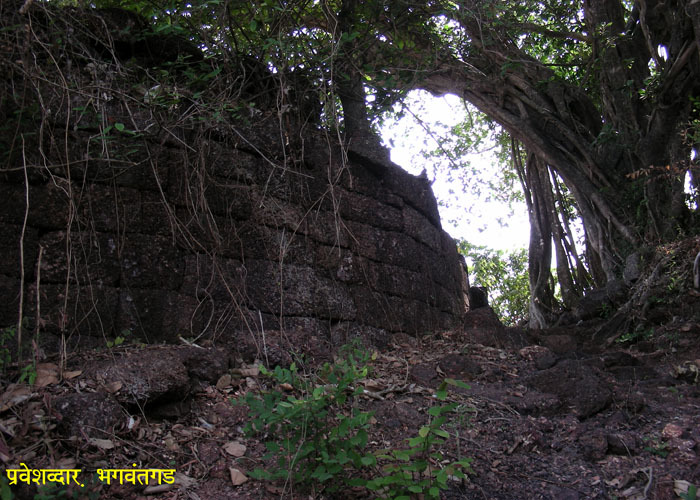 In the year 1701, the Sawants constructed Fort Bharatgad in Masure Village on the Southern banks of Kalaval Creek. To challenge or counter this move, Ramchandra Pant Amatya constructed Fort Bhagwantgad on the hills of village Bandiwade on the Northern banks of Kalaval Creek. The Sawants, were able to take control of this fort at a later stage. Tulaji Angre attacked Bhagwantgad in the year 1748, but he was not able to conquer it for the next 1.5 years. Then on 29th March 1818, the 4th Rifle conquered it under the leadership of Cpt. Grey & Pearson. Bhagwantgad can be reached by boat from Kava Masure village with a nominal fare of Rs. 5 per person. On alighting on the other side of creek in village Bhagwantgad, a 5 minutes walk to the left take us near a school. A further 10 minutes walk from the backside of the school takes us to the fort. Main entrance of the fort has hardly any remnants. The bastion and fortifying wall are in complete ruins. Lord Siddheshwar�s Temple on the fort is the only remaining architecture. The shapeless stone inside this temple is the idol of Lord Siddheshwar. A holy basil plant planted in a special masonry structure of 4 feet height (Tulsi Vrindavan. This is generally found in the center of courtyard of Hindus houses) can be found in the temple premises. As the fort hardly witnesses visits of tourists / trekkers , there is a dense vegetation cover all over the fort. Due of this, the remnants on the fort can hardly be seen. The remnants of fortifying wall are spread all across the fort. One can take a bird�s eye view of Bharatgad and Kalaval creek. On the way to Bharatgad from Malvan, an ancient Rameshwar Temple near Angnewadi village can also be visited. Bharatgad and Bagwantgad being small forts, are convenient to be covered at a time. To reach Bharatgad one has to alight in Masure village from Malvan. After visiting Bharatgad, approach Kavavadi or Kavamasure vadi at a distance of 1km from main chowk of Masure village. Take a boat from there to reach on the otherside of the creek, alighting in village Bhagwantgad, a 5 minutes walk to the left take us near a school. A further 10 minutes walk from the backside of the school takes to the fort Bhagwantgad. State Transport buses or Autorikshwas from Malwan take you directly to Bhagwantgad village. Nil. Available in Masure village or Malwan.